Journal of Young Pharmacists - is a peer-reviewed open-access Quarterly journal featuring research articles of exceptional significance in all areas of Pharmaceutical sciences. 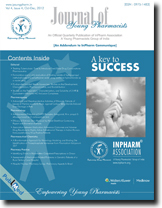 J Young Pharm provides comprehensive coverage of issues affecting Pharmaceutical education and Career. The Journal of Young Pharmacists is pleased to announce that it has been accepted for indexing in the Emerging Sources Citation Index (ESCI), a new edition of Web of Science™. Content in this index is under consideration by Thomson Reuters to be accepted in the Science Citation Index Expanded™, the Social Sciences Citation Index®, and the Arts & Humanities Citation Index®. The quality and depth of content Web of Science offers to researchers, authors, publishers, and institutions sets it apart from other research databases. Induction of Epithelial Ovarian Cancer by Implantation of 7,12-dimethylbenz(a)athracene (DMBA) Coated Silk in Rats. Ex vivo and in silico Molecular Docking Studies of Aldose Reductase Inhibitory Activity of Apigenin from Morus indica L.
Authors: Nair, Gayathri M., Skaria Dona Sheba, James Teenu, and Kanthlal S. K.
Journal of Young Pharmacists by InPharm is licensed under a Creative Commons Attribution 4.0 International License. Based on a work at http://www.jyoungpharm.org.